I first saw swift foxes in Shirley Basin. I didn't know what species of fox they were--these foxes are smaller and have different coloring than the red foxes I have seen around Casper. 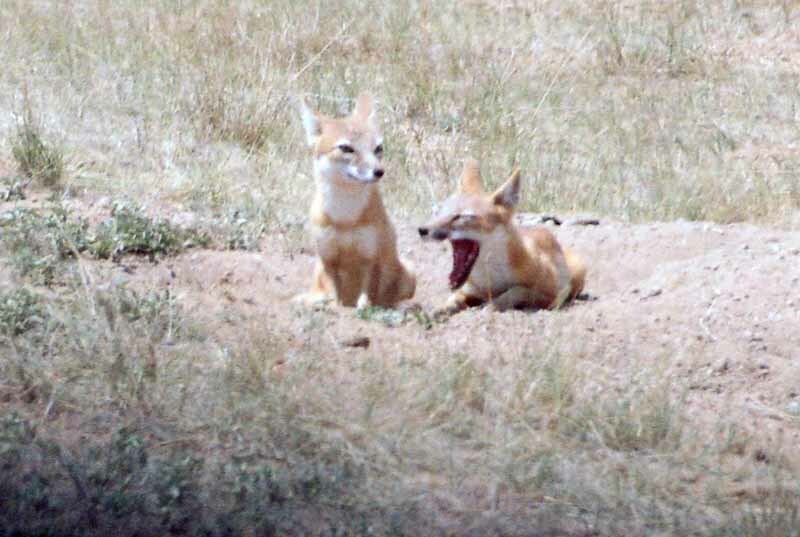 Then I found a photo in the Wyoming Wildlife magazine that identified the critters as swift foxes. 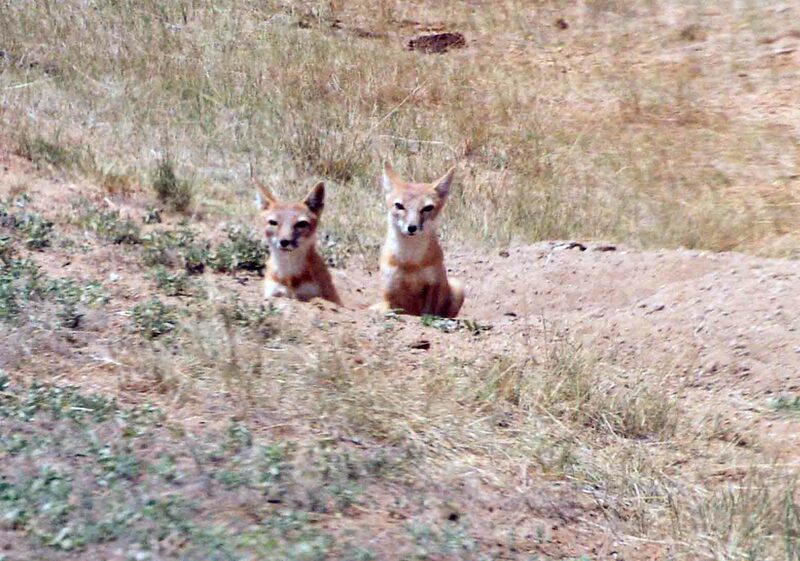 I have also found some articles and had some people call them "kit foxes", although I believe these are two separate species. These foxes are very small--about the size of a large domestic cat. They live near prairie dog towns in Shirley Basin, on the open prairies. Swift foxes are considered "endangered" in Canada. Wyoming Game and Fish considers them a "species of special concern" because not much is known about these foxes. There are organizations that are doing counts, etc, to try and establish baseline data currently. Swift foxes have litters in early spring, with four or five pups. I have seen five pups on the top of a borrow, "playing" together. We often see the pups hiding in or congregating near culverts under roads. The foxes are somewhat afraid of people, but if approached slowly, one can get fairly close to them. The young ones are the most curious, of course. It was interesting that on the Hinterland Who's Who site in Canada, the author of the article said swift foxes do not like wind. This was interesting because the Shirley Basin area is a high wind area (50 to 70 mph at times), 30 mph much of the time. The foxes seem to have adapted well to the wind in the area. Swift foxes are reported to be mainly nocturnal. However, we have seen them out in the daytime until about 10 or 11 am. We see them often enough in the daytime that I did not realize this was a nocturnal species. Part of it may be that we usually see juvenile foxes, rather than adults, or more research is needed. Swift foxes eat rodents, rabbits, and pretty much whatever is available in the area. 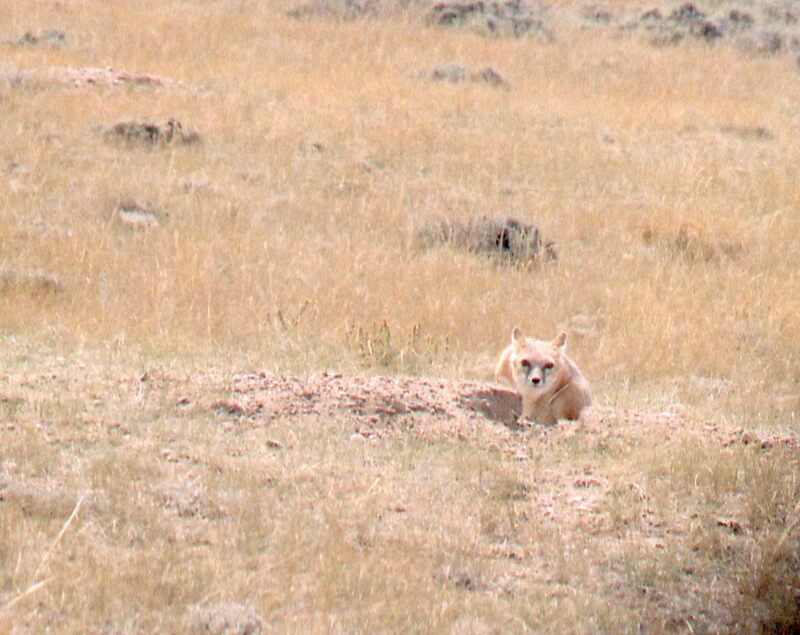 In Shirley Basin, there are numerous prairie dog towns where the foxes live, providing a steady food source. 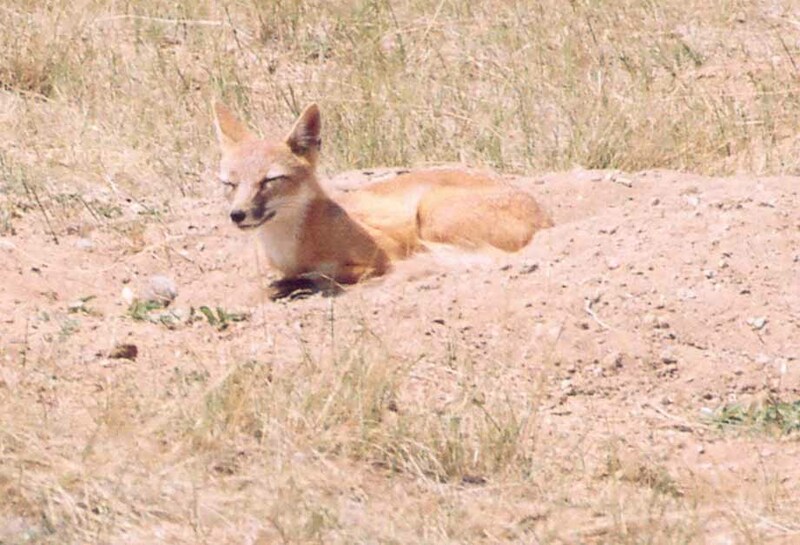 While the foxes often "borrow" the burrows of other animals, they can also dig their own burrows. They are named "swift" foxes because of the speed with which they run. They are definitely hard to photograph once they decide to run! I found a large variation in life expectancy estimates. The Canada site says eight to ten years. Defenders of Wildlife say three to four years. Food sources, predator numbers, and so forth may account for some variation. One of the possible threats to this fox is the subdivisions springing up where there was once grassland and prairie. There does not appear to be any research showing whether or not the foxes can adapt to the change. At one time, the fox was considered a candidate for the ESA, but not enough is know about the species to list it. 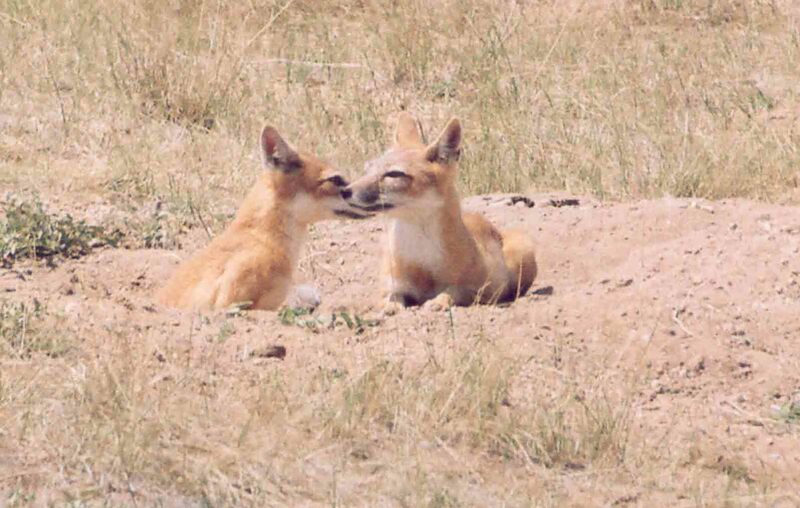 These are interesting little foxes and I hope to study them further this summer!